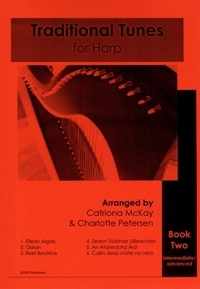 A collection of arrangements of traditional Scottish melodies arranged by Catriona McKay and Charlotte Petersen for the Intermediate / Advanced lever harpist. Published by CMCP Publications. A beautiful air from the Simon Fraser Collection. Catriona has recorded a harp and fiddle version on the Fiddler's Bid CD, Hamnataing. An arrangement of the haunting Scott Skinner melody. This tune has ambiguous origins. Some say it began as polka from Ballo Liscio dance repertoire called Oggi Nevica, which means "Today it snows". Others attribute it to the Quebecois fiddler Joseph Bouchard (1905-1980). 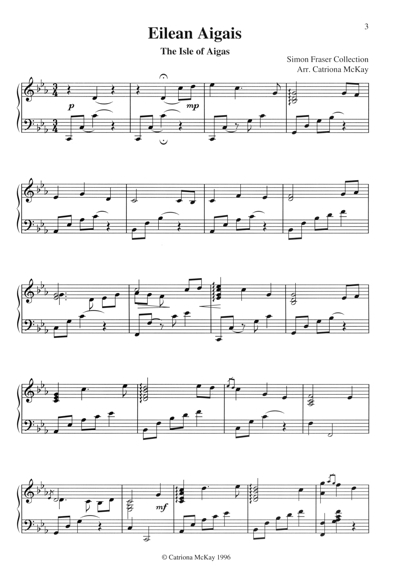 A tune from the Simon Fraser Collection, which Charlotte arranged for the advanced competition in the National Mod 1994. This gorgeous Gaelic song was arranged by Charlotte for her pupil Claire Johnston in 1993. At a meeting of ten harpers in Belfast in July 1792 Edward Bunting was commissioned to take down the airs played by the harpers. This is number 54 from the collection.